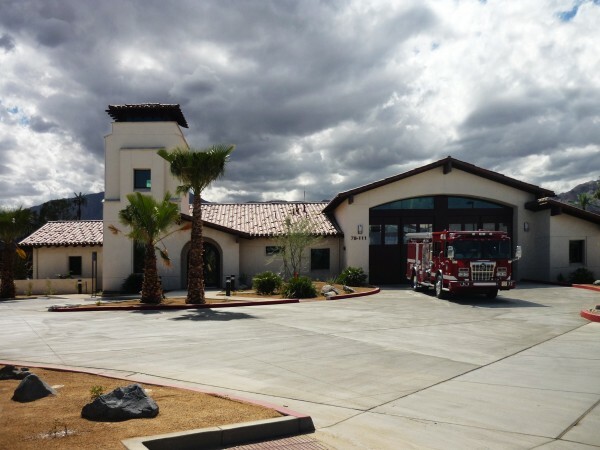 LA QUINTA (Nov. 22, 2010) – Spanish Colonial-style bifold doors opened recently at La Quinta Fire Station No. 32, the desert community’s new four-bay fire station designed by domusstudio architecture. Featuring state-of-the-art technology and energy-efficient systems, the new station meets the needs of today’s firefighters and also fits into the character of Spanish Colonial-style La Quinta Village, according to Wayne Holtan, AIA, a principal at domusstudio architecture. The San Diego firm has a portfolio of more than half a dozen fire stations throughout Southern California. “I am pleased with the way domusstudio architecture has pulled in design elements reflecting the old world architecture of the La Quinta Village area. They’ve done a really nice job with that,” said CALFIRE/Riverside County Fire Division Chief Dorian J. Cooley. Among the unique features at the new fire station are bifold station doors, which open faster than traditional rollup doors.